Though more expensive than the rest of the LiteMax line ($99-160), this car seat has an easy-to-use LATCH system, a full-body infant insert, softly padded straps, a large canopy, and breathable fabric. It also accommodates infants from 4 to 35 pounds, with the insert. The ergonomically-shaped carrying handle and leveling indicator on the side make installation quick. In addition, the LATCH system installation is really easy, and there’s a belt lock-off option to keep the belt at a consistent length and tension. It’s also incredibly lightweight, roughly 8 pounds, which is comparable to some of the other top-sellers. The soft, breathable fabric is easy to spot-clean with a wet wipe, but it removes easily for machine-washing. The buckle storage slots on the side are designed to keep the buckles out of the way, which is handy and convenient for putting your baby in the seat. While most car seats use Velcro for this, which can wear out over time from use and debris, this feature is designed to last. For cons, this seat is quite narrow and unlikely to accommodate babies over 20 pounds, the plastic isn’t as durable as some of its competitors, and the chest buckle doesn’t have the audible “click” to let you know it’s securely fastened, which isn’t good for peace of mind. 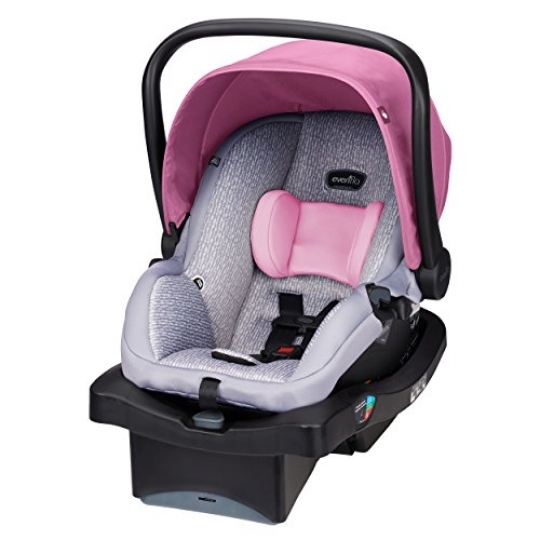 Overall though, this seat offers a great, ergonomically-designed handle, canopy, infant insert, LATCH system, padded harness, and soft fabrics.